This is a featured article. Learn more about Charlottesville's 250th Anniversary in cvillepedia. City Council allocated $1,000 in February 1957 to purchase more land for the cemetery from the estate of Hugh R. Hawkins. In May 2012, City Council sold this land to Southern Development. ↑ Web. 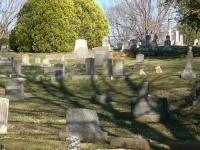 Oakwood Cemetery, City of Charlottesville, retrieved 18 May 2012. ↑ 2.0 2.1 Web. Oakwood Cemetery, Neighborhood Development Services, State and National Historic Districts, Resources & Surveys in Charlottesville, City of Charlottesville, retrieved May 7, 2012. ↑ Web. Charlottesville City Council meeting minutes, .pdf, Council Chambers, City of Charlottesville, 4 Feb. 1957. ↑ 4.0 4.1 4.2 4.3 Web. City Council agrees to sell Oakwood Cemetery expansion area, Sean Tubbs, Charlottesville Tomorrow, 9 May 2012, retrieved 16 May 2012. This page was last edited on 20 February 2019, at 10:48.